Adobe Reader LE developed by Quickoffice and optimized for S60 3rd Edition mobile devices, lets you view PDF (Adobe Portable Document Format) files on the go - anytime, anywhere. 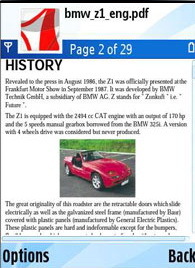 Enjoy enhanced PDF viewing with faster and easier to read single column text reflow that resizes documents for greatly improved readability on the small screen. Version 2.5 is the next of Adobe Reader LE for mobile devices with improved performance, such as opening large files faster, and an easier, more intuitive navigation. Quickoffice is the Exclusive S60 Provider of this release.